COMPANY PROFILE Tesla Inc is a vertically integrated sustainable energy company. It designs, develops, manufactures and sells high-performance fully electric vehicles and electric vehicle powertrain components. 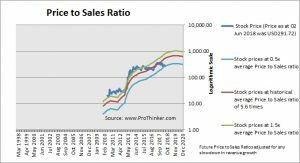 Companies that are trading at high Price to Sales ratios, like this company, do so because historical revenue growth has been high and investors are optimistic about future revenue growth. However, no company can continue to register the same high growth rates forever. Eventually it gets much bigger and growth rate will slow down. When that happens, one should adjust the expected future Price to Sales ratio in response to the expected slowdown in revenue growth and see if the current stock price is still justified, as what we have done below. At the price of USD291.72 as at 02 Jun 2018, Tesla Inc is trading at a Price to Sales Ratio of 3.1 times last 12 months sales. This is a 44.0% discount to its historical average Price to Sales Ratio of 5.6 times. In the case of Tesla, since there are no dividends and the company is not expected to make a profit until 2020, it is not possible to incorporate these indicators into the overall stock valuation. 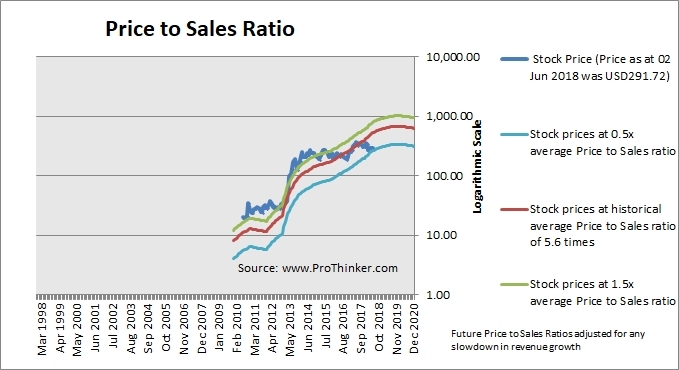 Therefore, relying only on Price to Sales Ratio is dangerous. If we were to take its current price divided by 2020’s earnings, PE stands at around 30x, which is high compared to the market.